I've had a little time to spend with my 22' Sport. In another thread, I mentioned some fit and finish issues that I find slightly disturbing. I would like to put in a disclaimer to say that overall, I am really happy with the layout and functionality of the Sport. It tows well and it looks really good. There are plenty of places where the fit and finish are quite good. I just want to point out a few things that I noticed and get some feedback from this community. First, the most functional looking issue. There is a gap between the window trim and the shell. I can see the insulation within (especially with a flashlight) and it was hanging out at delivery. 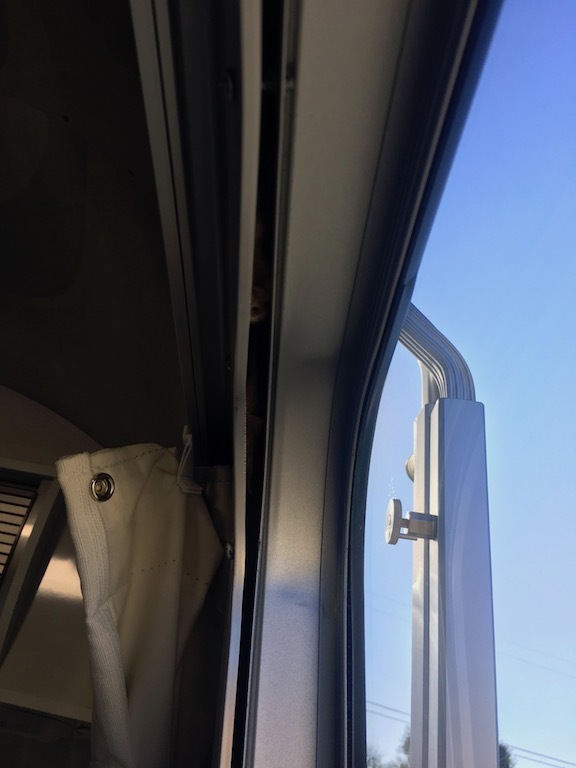 This issue exists on two windows on the driver's side of the trailer, but not on any other windows. I was told they couldn't close it up because of the curvature of the walls. Next, the base trim on the opposing window (emergency exit) is crooked. I cannot readjust it. On to less functional, but slightly shoddy looking trim issues. The caulk around the sink drain is a bit embarrassing. 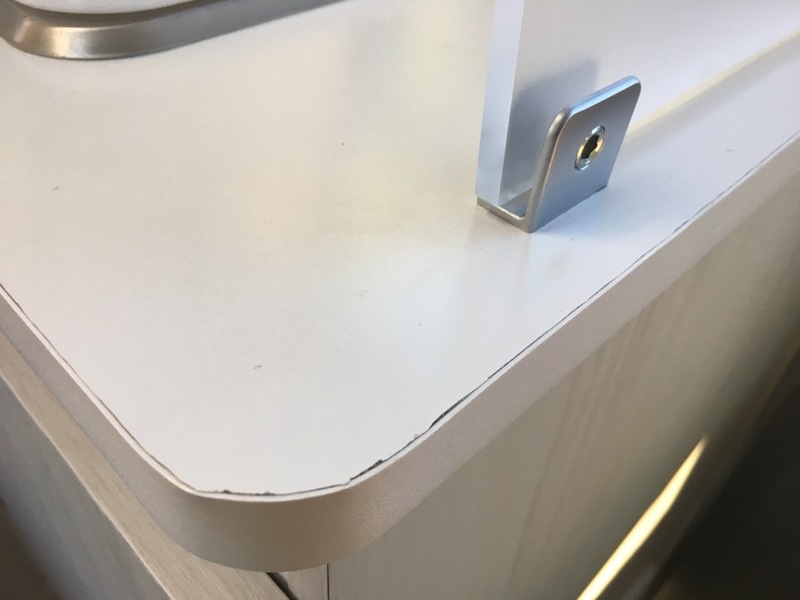 And this formica countertop edge..
Any feedback on where these fall in the range of "normal" to "needs to be fixed" would be appreciated. Sorry for the shameless bump, but maybe I should ask in a different way. Can someone else with a 22' Sport take a look at these same spots and tell me if their experience differs? The formica is on the countertop that wraps near the foot of the bed. If I'm being overly picky, I'm amenable to hearing that as well. 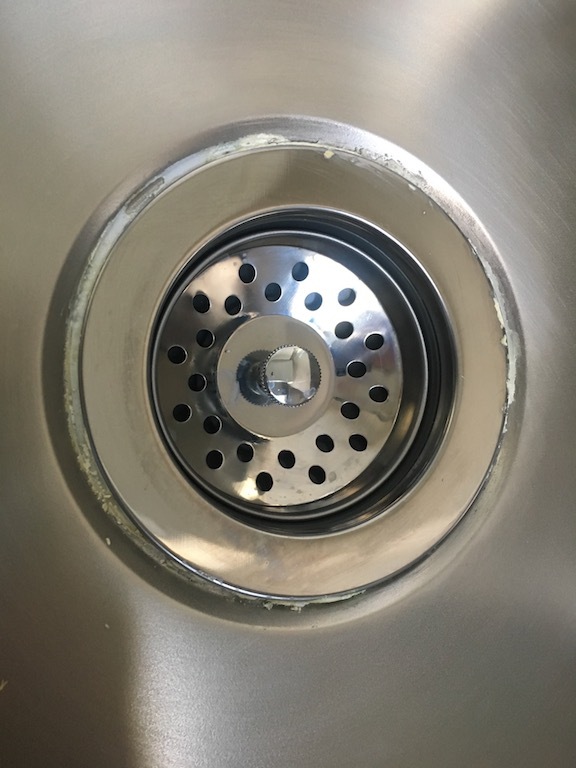 The caulk on the drain can probably be cleaned up with a toothpick or bamboo skewer. Easy fix. Migrating caulk on a new drain fitting is not unusual. It should clean up easily. Agree and, in truth, it is a good sign that adequate plumbers' putty is in place. Often, simply wiping with a paper towel (multiple times) will remove such. It's best if it is dry. The rough Formica edge is unfortunate. I would fill in the spaces between the Formica and edge banding with white caulk. The caulk is an easy DIY fix, wipe or scrape it off. The rest look like valid warranty issues to me. If your local dealership claims they can not fix or refuse to even attempt repairs contact the mothership. There is no excuse for crappy fit and finish, period. Remember that you can take you Airstream to any Airstream dealer for warranty repairs per Airstream policy. I agree with Tim's very practical assessment. I also want to mention another area to check, since I can't see it for sure in your photo. On our 22, the set screws that secure the opaque panels by the bed seem to tend to work lose and fall out frequently. They are about the size of one of those small flat circular batteries that are found in some clocks. I can't tell for sure, but it looks like yours may not be in place. I now just tighten mine up with a butter knife easy-peasy each time I think of it. Reluctant to use locktite since I figure that the flex on these panels may be needed when bouncing down the road. Piggy Bank: My set screws are in place. They're hex-head screws, maybe that changed since your build, and would explain why they looked "hollow." What I'm hearing is a range of "it's kind of normal" to "you should probably have some of that looked at." I will likely ask them to check out the Formica at my next appointment. I plan to take the window apart myself and see if I can get the fitment to my own satisfaction. I scraped at the plumber's putty but it's very flaky/dried at this point so I'm going to remove both drains and do the job to the level that I desire. Sometimes it's easiest to please your own aesthetic by doing it yourself. I also agree with Michael that any reputable dealer should fix any of the issues, I'm a bit surprised you got pushback. Our dealer (Profile) has been FANTASTIC about making small repairs and corrections. Both of our '16 16 Sport and the '17 23FC had a few minor problems similar in nature to what you have and our dealer gave us no (zero) flak about fixing them. If the dealer is not getting the job done, politely call Airstream and ask what can be done to correct the issue. 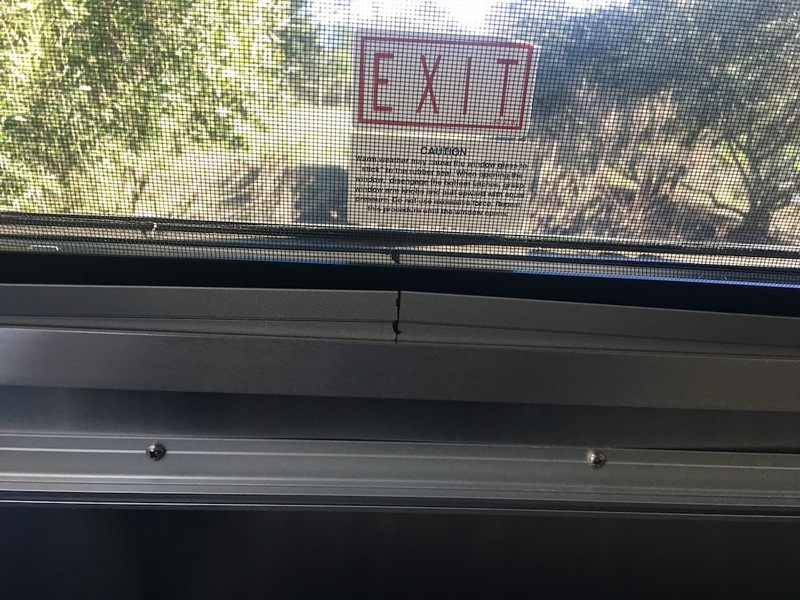 Personally I'd let the exit window thing go, and probably the gap too if it's under 1/8" - 3/16". If it's a 1/4" + and they can't close the gap, they can certainly fab you a trim piece. I'd ask the dealer to fix the formica as well, if you try and use a knife yourself you may scratch it. Where things meet up with walls I'd be more forgiving but being that it's a straightforward edge they were just using a dull blade / bit and should fix it. I think you just got the trailer? If so I'd recommend holding off a bit and making a punch list, when you use the trailer a few times you are sure to notice another issue or two. Pre-schedule an appointment and take it to the dealer later this winter (before the busy season starts) or just let the dealer know but hold off till next season. Following with interest to find out how things go and what decisions you make. “I believe in everything until it's disproved. So I believe in fairies, the myths, dragons. It all exists, even if it's in your mind. " I agree that you should have someone take a look at the windows and the Formica. The Formica looks especially shoddy to me. I got pushback when picking up our trailer both times, but when I brought it back in for warranty work I had no issues. It might be a difference in what the dealer can charge back to Airstream. Warranty vs. prep? Use your nice new AS for a few months and you may find these pesky cosmetic problems may disappear into the back ground. My 26U is nearly a year old now and it had it's share of cosmetic issues that I agonized over for a few months. Bathroom door thats a bit warped, chip out of the kitchen counter, blind mounted crooked, unattached shower head holder, slight bulge in floor covering. Over time I straightened numerous crooked switch covers, straightened trim, replaced plastic latches, etc. And now that I've used the AS for about 12 weeks last summer, got the inside covered with dog hair [2 Labs], had mud tracked in, outside covered in rain, sleet and dust, those cosmetic issues above hardly enter my mind now. And you know what? My Airstream doesn't leak! Yet!..So we're Golden! Or should I say Silver! I've had three Airstreams since 2004 and each has had some fit and finish issues. On our 2017 25FB Serenity, all of the overhead cabinets' trim and the bathroom door window frame have ill fitting aluminum angle iron trim. The mitered corners are slightly askew and have gaps. We've decided to live with this for the time being. I'd really only trust technicians at the Mothership to do a correct repair on this fit and finish item. Having them remove the edge banding and try to smooth out the edge of the Formica can result in more cosmetic problems. If my suggestion of filling in the space with caulk is followed, fingers or a plastic putty knife are better than a metal putty knife. The upside down lock and having to lift the door handle rather than push it down, I am considering "character"
As far as I know, that is standard and probably for a good reason. Bouncing up and down on the road, the inertia of the door handle (plus gravity) could open the door if it opened by pushing down. For the price, one should be able to expect much better quality control from the factory. Sadly, it seems, too many buyers have experienced poor workmanship.